Offtree supplies yarn for almost every imaginable purpose in the UK and overseas. Each week we are responsible for shipping over twenty tonnes of yarn. We deal with over 200 customers involved in every aspect of textile production: weavers, knitters, spinners, carpet manufacturers, hand knitters, circular knitters and tug makers. In fact, our customers are involved in every stage of the textile production cycle. We are situated in the North West of England; ideally placed for Scotland, Lancashire and Yorkshire, Nottingham, Leicester and the South– we cover the whole UK textile manufacturing industry. Offtree was founded in 1996 by Peter Andrews when Coates Viyella, a large yarn manufacturer, was sold and production closed down. Peter wanted to continue to provide his clients with the service and expertise they demanded. 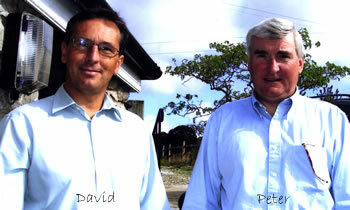 David Thornton joined Peter in 2006 after selling Thornton, Kelly and Company, a textile manufacturer run by David for the last twenty years. Offtree Ltd, registered in England & Wales.